Trees and shrubs are fantastic in our landscape. They provide many benefits such as shade, structure, erosion control, street appeal and privacy. But over time they can block the view, block the winter sunshine or simply spread into neighbouring properties. The good news is this doesn’t mean you have to remove the tree or shrub. Tree trimming, thinning and pruning can restore most unruly greenery back to their former glory. Fruit trees, deciduous trees, New Zealand native trees, shrubs or exotics, no matter what the variety, they can all benefit from thinning and pruning. Thinning and pruning forms an essential part of our arborist services. Our qualified teams can resolve many problems with our expert trimming. Whether we need to prune out deadwood, cut back overhanging branches, trim hedges or thin out trees and shrubs to let in more light, you can trust we’ll do it with the care and attention our green companions deserve. We’ll also identify disease within trees because it’s important to prevent its spread. And it doesn’t end there. Our arborists take as much pride in cleaning up after themselves as they do cutting and caring for your trees. They’ll collect and recycle the organic matter into firewood or mulch so there’s no mess for you to clean up after we’ve gone. Should it seem like any of the trees and shrubs have outgrown the site, we have professional reduction and shaping services to tackle this problem. Or if you prefer to start again with something new, our tree removals, stump grinding and planting services can efficiently deal with any size project. From council parks and streets to backyards, rural properties and complete subdivisions, our team of arborists can provide the services you need. Whether your project is commercial or residential, large or small, contact us now, our consultants are ready to work with you. 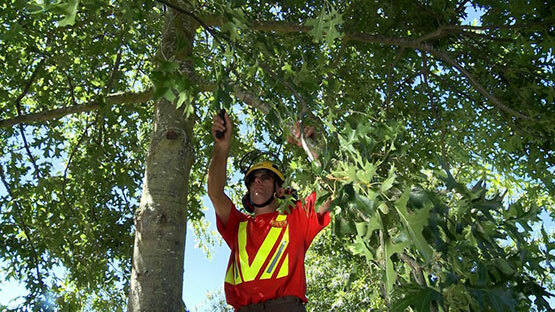 Contact us today for tree thinning and shaping in the Canterbury or Wellington areas.